The long opening sketch, Confuse a Cat, seems to be an excuse for a sequence of frankly bizarre images, such as a penguin on a pogo stick (not a sentence that tends to get typed very often!). Before this though, Graham Chapman’s vet is able to put his finger exactly on the cat’s problem. You see …. your cat is suffering from what we vets haven’t found a word for. His condition is typified by total physical inertia, absence of interest in its ambiance – what we Vets call environment – failure to respond to the conventional external stimuli – a ball of string, a nice juicy mouse, a bird. To be blunt, your cat is in a rut. It’s the old stockbroker syndrome, the suburban fin de siecle ennui, angst, weltschmertz, call it what you will. The rest of the episode contains shorter sketches linked by a series of vox-pops. The Cleese/Palin sketch with Palin as the world’s most inept smuggler and Cleese as the customs officer is probably the best of the bunch, although as it features a punch-line it feels a little out of place as a Python sketch. Possibly, like some of the other early sketches, it predated the series? After this, Terry Jones attempts to chair a discussion on the points raised with a duck, a cat and a lizard. Since all are stuffed, this doesn’t generate a great deal of debate. Luckily though, there are plenty of men in the street who are able to offer an opinion, such as this stockbroker (played by John Cleese). Well I think they should attack the lower classes, first with bombs and rockets, destroying their homes and then when they run helpless into the streets, mowing them down with machine guns. Ad then of course releasing the vultures. I know these views aren’t popular, but I have never courted popularity. 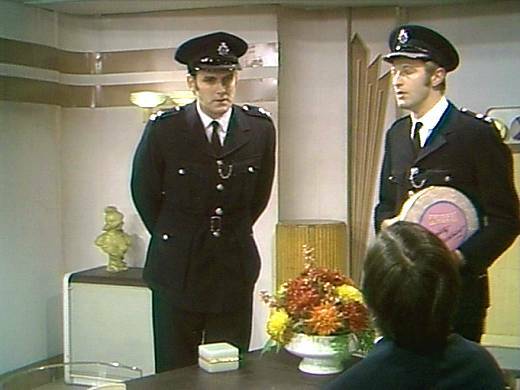 A Cleese/Chapman sketch featuring Cleese as a bizarre interviewer and Chapman as a bewildered interviewee doesn’t really go anywhere – there would be better examples of the domineering Cleese to come in future episodes. Like a lot of Man’s crisis etc, the Encyclopedia Salesman sketch is a throwaway, but I’ve always rather liked it. 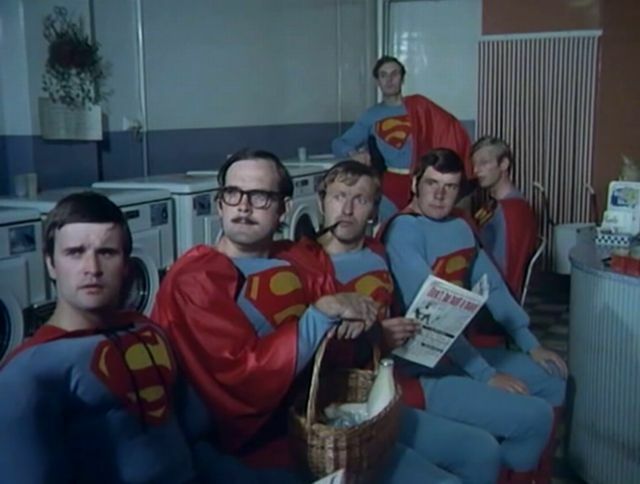 As I pulled Monty Python’s Flying Circus Series One down from the shelf for a rewatch, I was thinking about this recent article in the Guardian which examined ten comedy shows and asked were they still funny? 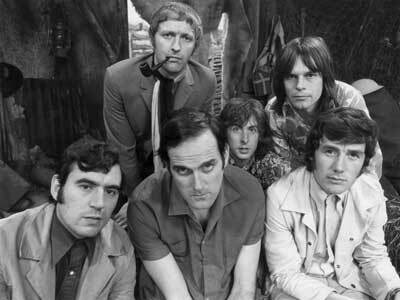 The verdict on Monty Python was a resounding no – because it was the typical sort of unfunny self-indulgent stuff dreamt up by university types, apparently. Although it’s easy to dismiss this as the usual Guardian space-filler, it’s true that Monty Python is very much a marmite show, you either seem to love it or hate it. Me? I love it, particularly the first series. This is probably because I taped the first thirteen episodes when they were repeated in 1989 (to celebrate the 20th anniversary of Python) and I did tend to rewatch them an awful lot during the 1990’s. 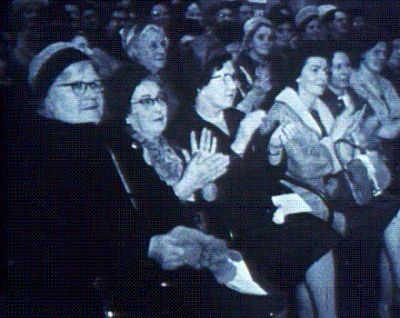 Looking back at the earliest episodes, the muted studio audience response is quite noticeable. According to legend, the first audiences for Python were bus-loads of pensioners who were disappointed that it wasn’t an real circus. Whether this is true or just a story that’s grown in the telling is debatable, but some sketches (which during their later stage shows would be greeted with rapturous approval) are played to near silence, with the odd laugh occurring every so often. As word of mouth concerning Python grew, the audiences for later series became much more vocal and appreciative. This isn’t always a good thing though – the somewhat boisterous and sycophantic audience on I’m Sorry I’ll Read That Again didn’t necessarily add to the quality of the programme, for example. The other notable thing about these episodes is that they’re somewhat rough around the edges. The numerous film inserts are fine, since they could be edited at leisure, but the studio footage does have a rawer feel, with the odd missed cue or wonky camera angle. Retakes could be done, although like all programmes of this era there was a strict timescale allocated to record the studio material and over-runs wouldn’t have been appreciated by the BBC management. So is there anything funny in the first four episodes? Let’s find out. Episode One – Wither Canada? After Wolfgang Amadeus Mozart introduces some famous deaths (to a rather nonplussed studio audience) we move to a more traditional sketch, featuring Terry Jones as the tutor of an Italian language evening course. The simple comedy device used here (and in many other Python sketches) is one of reversal – as all of his class (with the exception of Helmut) are Italian. Teacher: Well, now, this week we’re going to learn some useful phrases to help us open a conversation with an Italian. Now first of all try telling him where you come from. For example, I would say: ‘Sono Inglese di Gerrard’s Cross’, I am an Englishman from Gerrard’s Cross. Shall we all try that together? All: Sono Inglese di Gerrard’s Cross. Teacher: Not too bad, now let’s try it with somebody else. Er… Mr… ? Teacher: Ah, Mr Mariolini, and where are you from? Teacher: Ah … you’re an Italian. Teacher Well in that case you would say: ‘Sono Italiano di Napoli’. Francesco: Non conosgeve parliamente, signor devo me parlo sono Italiano di Napoli quando il habitare de Milano. Teacher: I’m sorry … I don’t understand! The good stuff keeps on coming – Whizzo Butter (“You know, we find that nine out of ten British housewives can’t tell the difference between Whizzo butter and a dead crab”) and Sir Edward Ross/Arthur “Two Sheds” Jackson. The Ross/Jackson sketches are essentially the same and playing them back to back is an early mission statement that the series wouldn’t be as linear as some of the Python team’s earlier efforts. Next up is my favourite sketch from episode one, the Picasso cycling race. For those who view the Pythons as elitist, it’s probably the sort of thing they detest, particularity when John Cleese, in the guise of a reporter, gives a breathless summary of the group of cycling painters zooming past him. It’s Kandinsky. Wassily Kandinsky, and who’s this here with him? It’s Braque. Georges Braque, the Cubist, painting a bird in flight over a cornfield and going very fast down the hill towards Kingston and… Piet Mondrian – just behind, Piet Mondrian the Neo-Plasticist, and then a gap, then the main bunch, here they come, Chagall, Max Ernst, Miro, Dufy, Ben Nicholson, Jackson Pollock and Bernard Buffet making a break on the outside here, Brancusi’s going with him, so is Gericault, Ferdinand Leger, Delaunay, De Kooning, Kokoschka’s dropping back here by the look of it, and so’s Paul Klee dropping back a bit and, right at the back of this group, our very own Kurt Schwitters. Some Terry Gilliam animations and The Funniest Joke in the World bring the first episode to a satisfying conclusion. Well, so far it all seems funny to me. There’s slightly less here that appeals, but Terry Jones with two large mallets encouraging his trained mice to squeak “The Bells of St Marys” is an appealing little throwaway. Cleese and Palin’s French aviation experts who demonstrate how sheep can fly is another nice sketch which doesn’t outstay its welcome. Buried in the middle of this episode is a real gem, the Working-Class Playwright. It gives Graham Chapman the chance to do a little bit of acting (no real surprise he took the lead in both Holy Grail and Life of Brian as he was always the Python who seemed the best suited to being, as it were, a straight actor). Terry Jones drags up well, as he would so many times in the future, as the mother, and Eric Idle is suitably wide-eyed as the son unable to convince his playwright father that coal-mining is a wonderful and worthy job. Another simple inversion sketch, which works a treat. The linking device of the trees (“Number One. The Larch. The Larch”) is probably the sort of thing that those who dislike Python would sieze upon. It’s not funny in itself, but then the question should be whether every single moment in each episode should contain a rib-tickling gag. But the device helps to bind the episode together. This episode has a couple of good shorter sketches, Michael Palin as the modest Bicycle Repair Man and Eric Idle as a children’s story-teller, totally unable to find a tale that doesn’t descend into filth (“One day Ricky the magic Pixie went to visit Daisy Bumble in her tumbledown cottage. He found her in the bedroom. Roughly he gabbed her heavy shoulders pulling her down on to the bed and ripping off her…”). The episode is dominated by three sketches, one of which would become an ever-present regular favourite in their stage shows. We open with a courtroom sketch. This is the longest single sketch we’ve seen so far (running for about ten minutes) but it doesn’t feel drawn out. Although Harold Larch is only charged with a parking offence, his counsel has lined up an impressive list of character witnesses, including the late Arthur Aldridge (complete with coffin) and Cardinal de Richelieu. Counsel: Er, you are Cardinal Armand du Piessis de Richelieu, First Minister of Louis XIII? Counsel: Cardinal, would it be fair to say that you not only built up the centralized monarchy in France but also perpetuated the religious schism in Europe? Cardinal: (modestly) That’s what they say. Counsel: Did you persecute the Huguenots? Counsel: And did you take even sterner measures against the great Catholic nobles who made common cause with foreign foes in defence of their feudal independence? Cardinal: I sure did that thing. Cardinal: Since I was so high (indicated how high). Counsel: Speaking as a Cardinal of the Roman Catholic Church, as First Minister of Louis XIII, and as one of the architects of the modern world already – would you say that Harold Larch was a man of good character? Cardinal: Listen. Harry is a very wonderful human being. 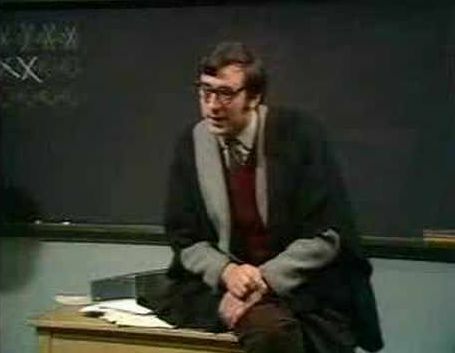 One of Python’s most famous principles was the abandonment of the punch-line (although Spike Milligan in his “Q” series had beaten them to it). There weren’t adverse to the odd punch-line though, particularly when it could be used for additional comic effect. Here, the upcoming punch-line is advertised with a caption and after Chapman has delivered it – “Lucky we didn’t say anything about the dirty knife” – the audience is free to register their disapproval. The show ends with Nudge Nudge, which is probably something that many people can repeat, virtually verbatim. I love the Pepperpots at the Art Gallery sketch. A typical clash between two types of culture that shouldn’t co-exist, which is probably the reason why it appeals. Marge: Oh hello, Janet, how are you love? Janet: Fancy seeing you! How’s little Ralph? Marge: Oh, don’t ask me! He’s been nothing but trouble all morning. Stop it Ralph! (she slaps at unseen infant) Stop it! Janet: Same as my Kevin. Janet: Nothing but trouble … leave it alone! He’s just been in the Florentine Room and smeared tomato ketchup all over Raphael’s Baby Jesus. (shouting off sharply) Put that Baroque masterpiece down! Marge: Well, we’ve just come from the Courtauld and Ralph smashed every exhibit but one in the Danish Contemporary Sculpture Exhibition. Janet: Just like my Kevin. Show him an exhibition of early eighteenth-century Dresden Pottery and he goes berserk. No, I said no, and I meant no! (smacks unseen infant again) This morning we were viewing the early Flemish Masters of the Renaissance and Mannerist Schools, when he gets out his black aerosol and squirts Vermeer’s Lady At A Window! Marge: Still it’s not as bad as spitting is it? Janet: (firmly) No, well Kevin knows (slaps the infant) that if he spits at a painting I’ll never take him to an exhibition again. Marge: Ralph used to spit – he could hit a Van Gogh at thirty yards. But he knows now it’s wrong – don’t you Ralph? (she looks down) Ralph! Stop it! Stop it! Stop chewing that Turner! You are … (she disappears from shot) You are a naughty, naughty, vicious little boy. (smack; she comes back into shot holding a copy of Turner’s Fighting Temeraire in a lovely gilt frame but all tattered) Oh, look at that! The Fighting Temeraire – ruined! What shall I do? Terry Jones gets to undress in public, or at least he attempts to do so. This is an odd one, a purely visual sketch (unlike the usual verbal fare) which is full of seaside humour and could have easily turned up in an episode of Benny Hill. 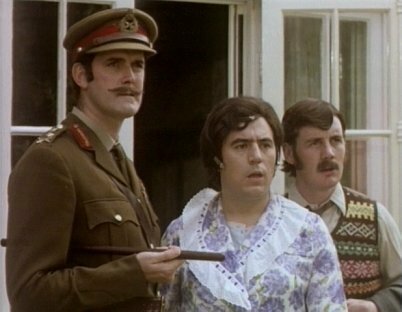 And there’s not many Python sketches you can say that about! Self Defence Against Fresh Fruit is another of my favourite Python sketches, principally for Cleese’s full-throated self defence instructor who’s keen to defend himself and his class against the dangers that fresh fruit can bring. Not one of the most famous sketches maybe, but it’s good fun. Secret Service Dentists is a slightly rambling way to close the show (and maybe a sign of the self-indulgence to come) but it still has some good moments, espcially the catchy Lemming of the BDA song.